This morning at the Fort, a small crowd of veterans, volunteers and one very cute little boy, gathered round to raise "Old Glory". 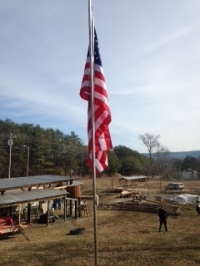 While the bugle played, the children saluted and the veterans raised the flag. Onlookers were moved by the incredible feeling of patriotism in that moment. God Bless America! Spread the word on Facebook by sharing our GoFundMe campaign on your page. Our Veterans will thank you. Rustic Log Siding For the Fort.